In the haunted burg of Death Village, there lives a nervous old man named Kevin. As the local real estate agent, it’s his duty to inspect all the empty houses, but he finds the job so terrifying that by the time he’s done he’s completely forgotten the way out! Fortunately, the local ghosts and ghoulies are actually quite friendly sorts and want to help him out. Can you use their powers to guide poor Kevin to the exit? Presenting the full version of Death Village! Along with the standard puzzle-solving mode, you’ll find a tutorial mode where you can get familiar with the controls and traps, a stage editor allowing you to create your own levels, and a Network Stage mode where you can upload the levels you created for people all over the world to play! In the game, you don’t directly control Kevin. Instead, he walks around on his own while you use the hand cursor to click and drag the environment, guiding him to the exit within the time limit. If Kevin bumps into a monster or falls from a great height, the game is over. You can also retry a stage by clicking on the “Give Up” button in the upper-right. Poor Kevin is a nervous fellow, and even the slightest noise will cause him to turn around. Seeing a monster or hearing a loud noise will cause him to run away in fright. Some stages will require you to purposely activate far-off traps or lead Kevin right in front of a ghost. The best way to find the route to the exit is to familiarize yourself with the behavior of the abandoned houses’ ghosts and traps. An old man who runs the only real-estate business in the inexplicably unpopular haunted town of Death Village. High-strung and skittish, he’s entirely the wrong man for the job, making his work in the haunted houses extra-tough. During the game, Kevin will wander back and forth, too frightened to consider where he’s going. He will go up or down any staircase he encounters. His old age has left him very absent-minded, and even if he has taken a staircase once before, he will forget about it and climb back up or down after passing by it one time. Soft noises will cause him to pause in his tracks, while hearing a loud noise or seeing a ghost will cause him to flee in terror. He may be getting up in years, but when he’s really and truly frightened he can even run fast enough to leap across gaps in the floor. 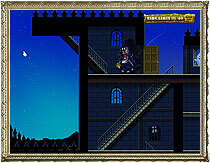 However, he will ignore walls and staircases while in a panicked state, which can be dangerous. The creepy-crawlies of the Death Village manors really aren’t that bad once you get to know them, and they’d like to help Kevin find the exits. You can command them, frightening Kevin in just the right way to guide him out, but if they touch him or otherwise scare him too much, he’ll faint dead away. Pops out when you knock on the window. He opens and closes the window with enough force to frighten Kevin considerably. Rattles the lid of his sarcophagus, then bursts out. After wandering a bit, he goes back inside to rest. You can knock on the sarcophagus while it’s rattling to prevent him from coming out. Hands swarm from the walls! They emerge close to Kevin and can panic him very easily, but he also runs a high risk of bumping into them while running, so take care. Flies about when it hears a noise. If Kevin panics and takes refuge in the bathroom, hands will come out of the toilet to keep him from staying too long. They’re not in every toilet, however. This prankster wanders about trying to smack Kevin with a pie. His body’s not that sturdy, and he will crumble if he takes a significant impact. A stickler for punctuality, this creature will appear if you run out of time. Turning shadow effects off can improve game performance, so if your game runs sluggishly, try setting this to Off. Click “Enter” on the title screen to view the mode selection menu. 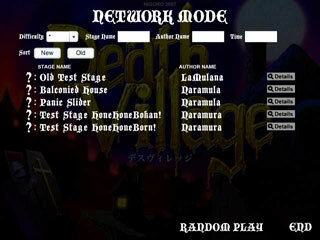 Play the 15 stages of the main game of Death Village. You can select different stages. Clear them all to see the ending. An editing mode that lets you construct your own original stages. You can also save the stage data you have created and release your stages on the Internet. 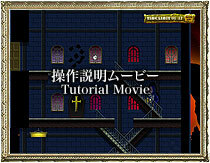 A series of 10 stages designed to help you practice the various traps in Death Village. 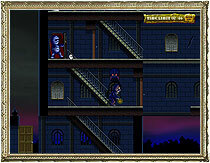 An explanation is shown before each stage. This mode is highly recommended for beginners. This mode lets you play stages that have been uploaded onto the Internet. New stages will continually be added from people around the world, so you can keep playing even when you’ve exhausted the rest of the game. Kevin’s patterns of movement change depending on how frightened he is. Normal: Kevin walks back and forth in either direction without stopping. He will ascend or descend any staircase he encounters. After using a staircase, he cannot take it again until he has passed by it one time. Curious: If he hears a soft or distant sound, a question mark (?) will appear, and he will set off to investigate the direction of the noise. He will ignore staircases as long as the question mark is shown. Jumpy: If a door slams behind Kevin, or he hears a loud noise, he will stop and start walking toward the noise. You can make him turn around and otherwise guide him by setting off noises on purpose. Frightened: If a door closes in front of him, or if he sees a monster from far away, he will be startled and run off in the opposite direction. He will stop if he reaches the edge of the floor. In this state, he will ignore all staircases, so you can use this to get him around stairs you don’t want him to take. Panicked: If Kevin is frightened several times in a row, or sees a monster appear right in front of him, he will panic. In this state, he will run pell-mell, leaping across gaps in the floor and opening doors by himself. If he runs into a wall or into a bathroom, he will calm down. If he gets panicked too many times in a row, he will faint on the spot and the game will be over. It would be wise to learn how to use all of these states to your advantage. Move the hand cursor over an object to change its icon. Knocking Hand: This means you can click to activate the trap or object. Gripping Hand: The cursor changes to this when placed over a door. Click and drag the cursor to open or close the door. This is the goal. Get Kevin here in time! Kevin’s too timid to open doors in dark places, so let’s click and drag to open them for him. Opening doors makes noise, but if you do it slowly the noise will be soft. You can also just click to knock on the door. Kevin only climbs up and down these when he’s feeling calm. While on the stairs, he takes extra care to watch his footing, so during this time he will ignore the noises around him. Click to transform the stairs into a slippery slope. If Kevin is on them at the time, he will slide down to the bottom. Some traps can be evaded by sliding. This floor is so thin that walking on it requires extreme caution. If Kevin is startled while walking on this, he will fall right through. Makes noise if it falls on the floor. If it hits Kevin it will knock him unconscious, but if he hits it while panicked, it will calm him down. The silver one will fall if it takes an impact from its surroundings, while the gold one will fall if you simply click on it. If Kevin passes by while the wind is blowing, his lamp will go out. Squeaks when Kevin walks across it. If a bat is nearby, it will react to this noise. 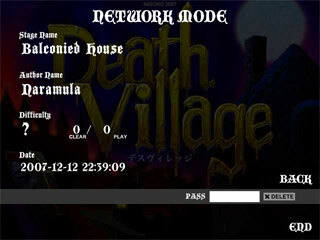 Select NETWORK STAGE on the title screen to view a list of uploaded stages. You can search by Difficulty, Stage Name, Author Name, and Time Limit. Set your desired search criteria, then click the Sort button (either New or Old). Clicking RANDOM PLAY in the lower-right corner of the screen will have a random stage selected for you. Click END to return to the title screen. Click a stage’s Details button to see detailed information about that stage. Stages can be deleted on this screen by entering the password set during the stage’s creation into the PASS field and clicking the Delete button. Click the BACK button to return to the stage list. 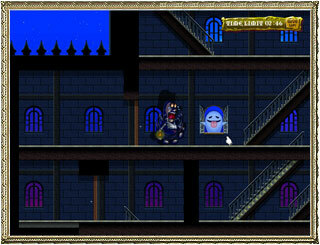 Stage difficulty is not specified at the time of creation. Rather, it is determined by the ratio between the number of people who play the stage versus the number who finish it.